As to be expected, this was easy and delicious. I would recommend trying out light cool whip to cut a few calories. Preheat oven to 350 degrees F. Foil line and Grease a 15-inch pizza pan. Prepare brownie mix according to directions on box. Pour onto prepared pan. Bake for 20 minutes or until done. Remove from oven and cool. Beat cream cheese while adding pineapple and sugar together in a bowl. Spread mixture over brownie crust. Arrange banana, strawberry slices, marshmallows, and cherries over cream cheese mixture. Sprinkle with nuts and coconut. 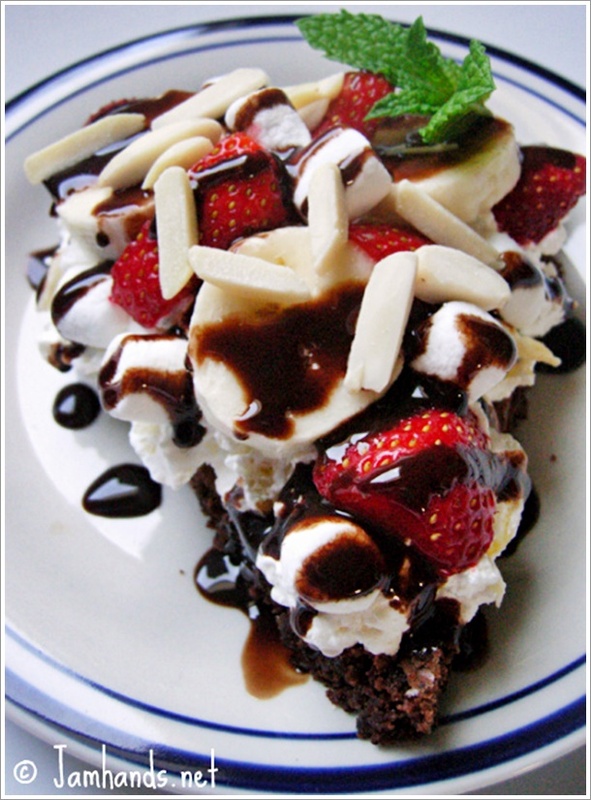 Drizzle with chocolate syrup. Add whipped cream on top and mint for garnish. To serve, slice as you would a pizza. Recipe from The FoodNetwork. Linked at Skip to My Lou. that looks AMAZING!! tho i think i gained 5 lbs just looking at the picture. can't wait to make this one! Oooh, look at that beautiful dessert-pizza!! I remember seeing the episode where Paula Deen made that treat - yum!! your blog makes me want to spend more time in the kitchen cooking!